This is an angsty story of a competitive swimmer desperate to find a life for himself beyond his father’s control. It is also the story of Brandon growing into himself and coming to terms with his sexuality. Both Brandon and Tyler feel more like character outlines than actual characters. Even though Brandon tells this story, I don’t feel like I got to know much about his hopes, motivations, or emotions. He’s sweet and good and conflicted but he just never really came to life for me. Similarly, Tyler shows up in Brandon’s life as an instant boyfriend. We don’t see much romance or feel much chemistry between the two boys. My favourite character is probably Joel – Brandon’s swim team friend. It’s Joel who first guesses Brandon’s orientation and Joel who does his best to make life easier for his friend. He’s funny and cocky and possibly the only character with any real personality in the story. This is a heavy book. Brandon’s father is almost a caricature – he’s a pushy sports dad and he’s controlling, domineering, and homophobic. He’s a pretty roughly crafted villain and we don’t ever glimpse his humanity and we never get a real explanation for his behaviour. This story feels like the old school young adult writing I remember from my own youth. It’s a topical story with fairly one-dimensional adults who are either bad or good and slightly bland teenagers who are keen to do ‘the right thing.’ The language is clean, Tyler and Brandon’s physical intimacy is completely off page, and the happy ending comes way too easily. For me, the simplicity of the story feels a bit patronising. There have been so many brilliant young adult books in the past few years where the boundaries between young adult and adult fiction are blurred and the teenage experience is written about in realistic shades of grey. As a result, I have pretty high expectations for contemporary m/m young adult writing and this book just didn’t work for me. ROBBIE MICHAELS grew up in rural upstate New York, the same setting as the beginning of The Most Popular Guy trilogy, and now the Caught series. It was not always easy growing up in a tiny town thinking he was the only person who felt and thought what he was experiencing. He felt like a stranger in a very strange land for most of those years, always having to act a part, play a role, until he later met other gay folks and found out that he was not alone. He was teased and bullied when others suspected that he might be gay. His name is still carved in stone back there with the words “Is a Fag” chiseled in beneath it. But that was then, and this is now. Now he writes stories about the underdog coming out on top, stories about the kids that don’t fit into cookie cutter molds of what others expect, and stories of hope and promise. He survived those days back in rural New York, and found that life does get better, even though at the time it sure didn’t seem possible. He wants first and foremost to tell others to hang on and to have hope for a better tomorrow. Grapple onto hope and don’t ever let go of it. Life is a wonderful, marvelous thing to be embraced and celebrated. Don’t ever give up. You are the only you there is, and you are not alone. There are many, many, many others like you out there and some day you will meet them and together you will change the world in a wonderful, positive way. 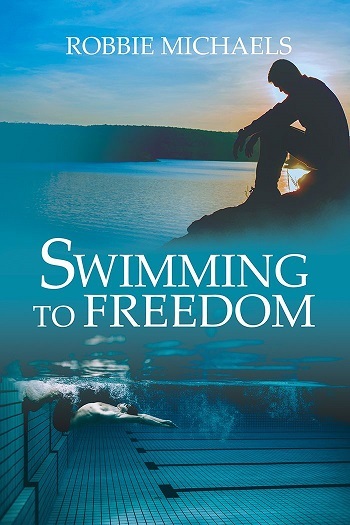 Reviewers on the Wicked Reads Review Team were provided a free copy of Swimming to Freedom by Robbie Michaels to read and review.